Save Your Back by Treating Your Tight Hip flexors and hamstrings? It’s a very bold statement but it’s also very true. If you neglect them, not only will they tighten up, but your back can suffer and anything that you do will become a chore instead of an activity. Healthy hip flexors and hamstrings are key to pain relief, no doubt. They are responsible for the mobility and stability of your lumbar spine. In fact, if you’re seated now and feeling sore and tight, you should practice the Seated Lunge right now. It will make a world of difference for you and requires little time and effort. Keeping them flexible and well-conditioned will not only help in preventing lumbar issues, but for the prevention of both hip and knee problems. If you neglect them, all three areas will suffer. Acute or chronic pain in these areas can be a sign of a medical concern which should be brought to your physician or health care professional. If your root cause of discomfort is muscular, it is important for you to understand why it is occurring in the first place. With added help and support here, you can take steps to correct the causes and have relief. Compared to more obvious muscle groups, hip flexors and hamstrings are not given much attention. Part of the problem is because unlike the other more visible and muscular areas of the body, we cannot ‘see’ how well or poorly conditioned they have become. It’s when we have pain in the hip joint, the rear of the thighs or other nearby areas that become sore, that we begin to learn more about them. One thing that we all are guilty of is sitting for far too long. It’s a big problem for both muscle groups because it makes them very inactive. When you do this, you start a cycle of atrophy and strain that you must learn to break. Can Tight or Painful Hip Flexor or Hamstring Muscles Affect Each Other? Yes, but pain in one won’t necessarily lead to the other. What they do both affect is the lumbar region of your back. 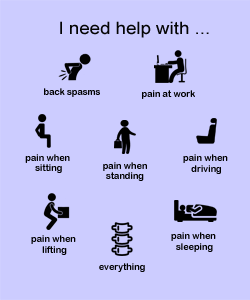 It’s pretty common to have isolated pain due to muscle weakness and tightness. But over time, these regions become weaker or tighter, and your lower back ends up suffering. The safety of your lumbar spine (specifically the L1-L5 vertebrae and discs) is directly affected by the action of the hip flexors and hamstrings. When you have an imbalance, your lower back can easily be subject to strain and injury. Below, you can take action necessary to reverse this imbalance and begin to reduce any risk of damage to your spine. Are You Hesitant or Lousy with Your Stretches? Take the Lazy Stretcher Test. Then Start Stretching! It pretty rare to have chronically tight (or short) hamstring muscles and NOT suffer lumbar pain. 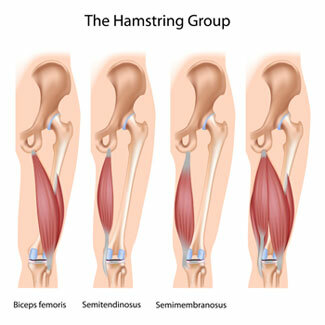 Hamstrings are very strong and large muscles which are often poorly maintained. You have probably found that they are very difficult to keep conditioned, no matter your time and effort. Tight hamstrings and hip flexors will often occur together. Their strong and constant pull can lead to an anterior pelvic tilt. 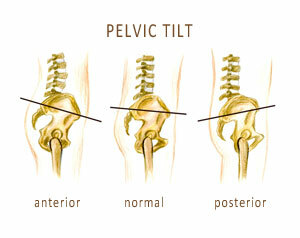 This forward tilt of the pelvis causes an increased pull on the hamstrings which also causes tightness. Another problem for and unbalanced pelvic tilt that can hurt, is from the hip flexor known as the psoas (pronounced “so-as”) muscle. Unlike the hamstrings, which are not connected to your lumbar vertebrae, the psoas is directly attached to each of the five lumbar vertebrae. You can see this is figure 6.1 below. Please see for further details. To maintain a healthy and safe curvature for your spine, ALL of the muscles which are located in front and behind the pelvis must act effectively and function in a balanced fashion whenever you’re actively moving. In doing this, they do the job to keep the pelvis in a neutral and safe position. This ‘neutral tilt’ is necessary to maintain evenly distributed pressure on the vertebral discs so you won’t have any injury. In figure 6.1, we see that they have various functions, especially where some muscles within the group cross over both the hip and knee joints. The group consists of the iliopsoas, rectus femoris, sartorius, tensor fasciae latae, pectineus, gracilis, adductors and a gluteal muscles. It is the iliopsoas muscle which has the strongest pull on our spine. It is attached to the L1-L5 and T1 vertebrae. A tight psoas (the part of the iliopsoas that connects to the lumbar spine) can pull on the spine and compress the discs and vertebral joints associated. This is a very strong muscle. If it is always tight, disc compression is higher along with soreness. Stretching your psoas is vital to back health. A chronic state of shortening can also worsen your anterior pelvic tilt which is very harmful to your discs, especially within the L5-S1 region. 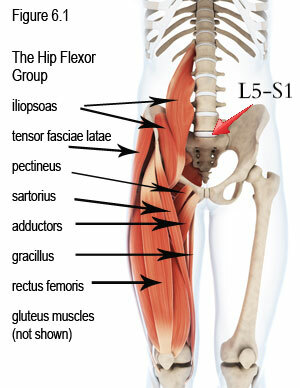 A tight iliacus muscle (part of the iliopsoas) is also part of having a tight psoas. In addition to this, the other muscles listed above can also affect your anterior pelvic tilt such as your rectus femoris. Most people do not have any serious conditions other than symptoms of fatigue in the lower back after extended times of sitting. They can usually cope with this temporary discomfort and will recover quickly. However, daily activities which involve extended and prolonged periods of inactivity or even over activity will cause muscle imbalances and chronic pain. Many symptoms of lower back pain can begin with tight hip flexors or hamstring muscles. It is rare to find a person who does not have tightness in these muscles, especially the hams. When these muscles are too tight, they prevent the pelvis from tilting forward in a smooth manner, simultaneously with the back when bending forward to neutral. As a result, you will mistakenly bend your spine, rather than at the pelvis to compensate for the lack of flexibility. Tight hamstrings are often very uncomfortable to stretch, and we find ourselves trying to avoid it as much as possible. We tend to favour bending at the spine rather than tilting our hips because of the discomfort we feel from tight hamstrings. The three major muscles of this group as seen in figure 6.2 are the biceps femoris, semitendinosus, and the semimembranosus muscles. These muscles are very challenging to stretch and require sincere effort, time and patience to achieve long-term results. The tightness of a muscle is usually the result of lifestyle but can sometimes be a natural condition in an individual. The better solution, however, is always to lengthen the muscle with stretching. Extended periods of sitting, as in the cases of driving, office work, sitting in front of the TV or even extended periods of studying will cause tightness in the hip flexors and hamstrings. During these activities, the muscles are in their shortened positions, with blood circulation and nerve activity within the tissue also being compromised. This not only produces a tight and shortened muscle but also contributes to overall weakness and decreased responsiveness in that muscle. During upright and active periods, these tight and weak muscles are sometimes required to perform the job of stronger and more lengthened muscles. This is likened to using a stiff, old rubber band instead of a new, more elastic one. When these muscles are required to perform daily work in the upright position, they will do so, but with added strain on the lumbar spine and discs. A lengthened and stronger muscle can extend and flex the legs with minimum effect on the normal curvature of the spine during activity. Short, tight and weak muscles will exhibit much more pull, tension and fatigue on the lumbar spine and pelvis as they are no longer as efficient at relaxing and lengthening at times needed during exertion. When hip flexors and hamstrings pull on the spine and pelvis with increased force and tension, the pressure on different sides on the discs increases dramatically and causes degeneration. This causes too much movement and compression on your spine and discs. They become progressively worn over time and may lead to disc and vertebral problems. The fact that we must ‘keep our spine straight and bend at the hips and knees’ is not really news to us at all, especially for back sufferers. What we must understand is that there is a direct relationship and correlation with your lumbar spine and your hips that cannot be overemphasized. The more that you use your hips and legs, the less work your spine must perform. To reduce the discomfort, these two muscle groups should be exercised in many different ways. This requires several different positions, stretches and movements. It is usually insufficient to perform basic, standard stretch and strengthening methods since they don’t necessarily target ALL of the muscles of concern. The Low Back Pain Program eBook teaches specific exercises that specifically target the hip flexors and hamstrings among other muscles groups involved. The exercises help the muscles and joints to move in a multitude of directions and positions. These methods teach you how to SAFELY stretch them without risk to your spine. You can learn better methods of safer stretching than the standard “toe touching” way that is, unfortunately, harmful to your back. This variation is key to relief. 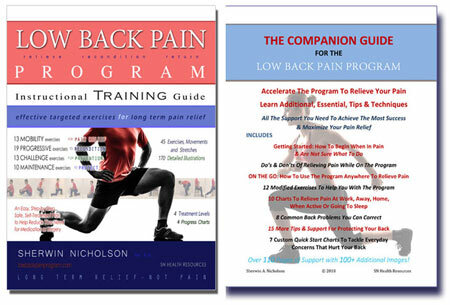 The Instructional Guide provides careful and progressive methods which allow them to function more effectively and help to reduce the unnecessary stress and burden on the lumbar spine. 7.14 Mb PDF, 60 day refund guarantee. What are the exercises that I will be doing and what is in the book? What have other customers thought about the book? Strength Training Anatomy – Frederic Delavier. 2006. QM151.D454. 2nd edition. Human Kinetics Publishing.